When Canon finally joined the full-frame mirrorless fray last year, it gave us two of the best mirrorless camera models currently available: the Canon EOS R and Canon EOS RP. At the same time, it introduced a brand new lens mount to replace the EF mount that had been used since 1987. The Canon RF mount has the same 54mm diameter, but boasts a flange focal distance (the space between the lens and the sensor) of 44mm (20mm shorter than that of the EF/EF-S mount, thanks to the lack of mirror) and 12 electrical contacts (4 more than EF/EF-S, providing faster communication). This facilitates a new generation of optics, capable of superior performance and additional characteristics, that promise to be among the best Canon lenses on the market. 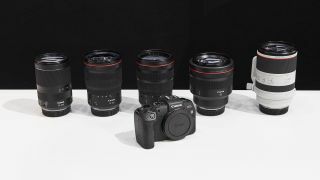 The EOS R launched with two native RF lenses; as of today there are four native lenses available, with the Canon lens roadmap promising that a total of ten will be released by the end of 2019. The Canon EOS R was bundled with this lens at launch, and that kit lens designation belies how good this optic really is. The first zoom, and the first stabilized lens, for the RF mount, it's a great all-round performer. Arriving at the tail end of 2018, this is a great example of the kind of optic that simply wasn't possible on the EF mount. Though a formidable tool for professionals, this bulky, heavy lens feels a little mismatched with the current R system bodies. The lightest, and currently only non L-series, lens in the RF mount lineup, this super compact lens is perfect for street and travel photography – and, thanks to its tiny size and weight, it pairs perfectly with the svelte Canon EOS RP. Launched along with the EOS R, the first prime for the system is a truly lustworthy lens. Sharp enough to cut glass and with bokeh to die for, it's a great showcase for what the RF mount is capable of. Filling the wide-angle gap for landscape shooters, this is the first of the all-important 'trinity lenses' along with the 24-70mm and 70-200mm optics. Many photographers have been waiting for these before migrating to the R system. The second of the trinity optics – all of which are image stabilized, with a fast f/2.8 aperture – this is the all-purpose lens that everyone from average Joes to working pros want in their kit bag. The third pillar of the holy trinity, this telephoto zoom gives the Canon EOS R and RP a native option for wildlife, birding and sports photography. It's also remarkably small – around two-thirds the size of the Canon EF 70-200mm f/2.8L IS III USM, only coming up to the focus ring of its EF counterpart when stood side by side. The only non L-series lens on the docket for 2019 seems, like the 35mm non-L before it, to be tailor made for the RP. An ultra-compact 10x optical zoom, it should be a must-have for the smaller system. A dedicated portrait lens, if it's anything like it's 50mm f/1.2 sibling it will be an absolute monster in the optical stakes. While it lacks stabilization, we expect this lens to be an instant classic. It was a very pleasant surprise to see Canon releasing another softfocus-style lens, which is a boutique product these days. "Using different lens elements, it will give a different look to foreground and background blur and a much smoother look to the bokeh effect," explained Canon's Product Intelligence Specialist, David Parry, of the lens' apodization effect. "And that will change with aperture as well, so you'll be able to get different degrees of effect on that depending on what aperture you're using." With a recent patent for another lens using the same apodization element, it seems that Canon might be toying with a Defocus Smoothing line. Lensbaby Optics, such as the new Lensbaby Edge 35, aren't lenses in their own right, but add-ons for the Lensbaby Composer Pro housing. At The Photography Show 2019, the company confirmed to us that the Composer will soon be coming to the RF mount. A mirrorless-fit version of Samyang's best selling ultra-wide angle prime lens. It is constructed from fourteen elements in ten groups, with one H-ASP element, one ASP element and two ED elements in its build, along with six aperture blades. Measuring 87 x 120mm, and weighing 800g, it does not have a front filter ring due to the bulbous nature of the front element. An update of a well-respected lens available in other mounts, known for its bokeh characteristics. The fast telephoto prime has a total of nine elements in seven groups, with eight diaphragm blades. An H-ASP lens minimizes various aberrations and maximizes the image quality and contrast from corner to corner, even wide open. Ultra-multi-coating promises low reflectivity and excellent contrast, and is claimed to offer high transmittance of light while minimizing flare and ghosting. The lens measures 78 x 98.7mm, weighs in at 730g, has a minimum focusing distance of 1m and has a front filter ring measuring 72mm.